Even before North India could recover from yesterday�s crippling power failure, the northern grid tripped again this afternoon, taking with it the eastern and the north-eastern grids. 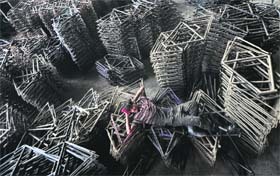 The result: Half of the country and over 64 crore people went without power for hours. Over the past two days, half of the country has witnessed scenes similar to Bruce Willis blockbuster Die Hard-III where normal life comes to a standstill. There were huge jams on the roads because there were no traffic signals, hundreds of trains were stranded, there was no electricity at home, no TV, no Internet, no working lifts and so on. In a minor reallocation of portfolios, Home Minister P Chidambaram was today shifted to the Finance Ministry which was vacated by Pranab Mukherjee after he was declared UPA's pesidential candidate. 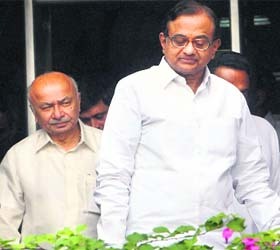 Union Ministers P Chidambaram (R) and Sushil Kumar Shinde come out after attending a meeting at Krishi Bhavan in New Delhi on Tuesday. An Indian Air Force search team has hit upon what could be vital clues in a nine-month-old mid-air supersonic MiG-29 crash mystery. 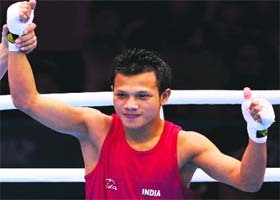 Flyweight boxer Devendro Singh packed a punch as he made entry into prequarters by beating Bayron Molina Figueroa of Honduras in the opening round after referee stopped the contest. Punjab and Haryana�s specific demands for extra power and immediate interim relief for the prevailing drought-like situation in the two states has gone unheeded, at least for now. 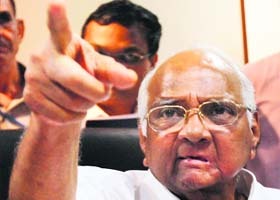 Sharad Pawar addresses the media in New Delhi.